The Wi-Fi Direct standard may get a much-needed boost next year from work by the Wi-Fi Alliance to make it easier to use for both consumers and developers. The specification for peer-to-peer links among devices debuted in 2010 and has been delivered in some products, including the Samsung Galaxy S III smartphone. (The AirDrop feature in OS X Lion relies on Wi-Fi Direct.) But it has yet to become a major platform for new uses of Wi-Fi across a wide range of devices. The Alliance’s Wi-Fi Direct Services task group, formed last month, plans to develop new software mechanisms to help devices and applications determine how they can work together, Wi-Fi Alliance Executive Director Edgar Figueroa said in an interview on Wednesday. Those efforts are on a fast track and should be completed within 12 to 18 months, he said. He spoke at a daylong event on “The Power and Potential of the Unlicensed Economy” at Stanford University, saying Wi-Fi is expanding beyond the home and office wireless LAN technology most familiar to consumers. 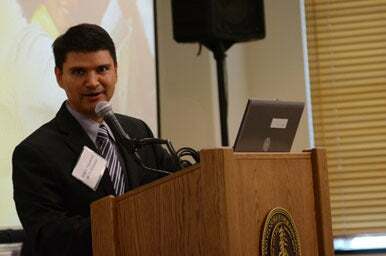 Wi-Fi Alliance Executive Director Edgar Figueroa spoke on Wednesday at an unlicensed spectrum conference at Stanford University. Wi-Fi Direct is a departure from the traditional role of Wi-Fi, which typically creates a wireless LAN to give client devices Internet access. It works between client devices themselves, which can include laptops, smartphones, TVs and printers. The idea behind the technology is that users will activate it for a purpose, such as printing, file transfer or streaming video, rather than just to get on a network. The Alliance is now refining Wi-Fi Direct to make it easier to find out what it can be used for in a given situation. It’s working on ways for devices to advertise their capabilities to each other and tell the user what they can do. With this approach, “The connection doesn’t come first, the application discovery comes first,” Figueroa said. Until now, the hooks that vendors can use to make their software and hardware work with Wi-Fi Direct haven’t been well enough defined, said Paul Lambert, director of engineering at communications chip maker Marvell, who works with the Wi-Fi Alliance. As a result, devices such as printers may advertise themselves to nearby users even though they can’t take print jobs from those users’ phones or laptops, Lambert said. The printer may be in the same room and have Wi-Fi Direct, but it hasn’t been able to establish the right connection with the client device. This has frustrated some printer makers, according to Lambert. “It’s been difficult to create interoperable applications,” Lambert said. As a result, “adoption has been inadequate,” he said. Alliance chief Figueroa acknowledged that devices sometimes advertise themselves even though they aren’t really available to the user. With the new specifications the Alliance is working on, users will see only resources they can use, he said. Better mechanisms for service definition and service discovery could open the door to more mobile developers creating applications that can use Wi-Fi Direct, Lambert said. He hopes to see apps that use Wi-Fi Direct to complement location technologies such as GPS and tell users about friends nearby. Lambert belongs to another group within the Alliance, the Neighbor Awareness Networking task group, that is studying this technology.